Déjà vu… All Over Again? that he was right and that 15 other business owners agreed with him (assuming that he was using the group to give him moral support for such a position). However, what ensued as I watched in dismay was a non-stop ‘mindset’ of denial. No matter what good advice was offered, he had a pat answer already formulated for each seemingly valid idea or question. He sounded like he had heard these same ideas once before and had thought about them (for at least 30 seconds each!) and concocted what would appear to be a valid excuse to DO NOTHING about ANYTHING he asked us about. Sadly this is often the case with some small business owners and they don’t see the pattern of their thinking/mindset. This mindset of ‘don’t make me do anything that will take initiative, risk, change, work effort or impose ACCOUNTABILITY on me’ reminded me why I was motivated write my new book, Set Yourself Free – How to Have A Thriving Small Business… And Enjoy It. Prior to writing the book I had struggled with trying to define exactly what it was that I have done for 45 years to help small business owners. No, it wasn’t about the operational, marketing and financial issues that full-service consultants do. Rather, the defining element of what I did was ‘changing mindsets’ of owners and managers so they could get out of their own way! If the young man in the above example could only have recognized his resistance to change and avoiding work and its impact on his business (having lost market share), perhaps he might have been more open to what was presented to him by some savvy business owners. So why was did I title this particular blog ‘Déjà vu all over again?’ Because I learned afterwards that this owner did the same ‘dance’ with another similar group of owners not long before this meeting. Perhaps he was ‘shopping’ for a different answer than he was getting from each group because the most obvious answer to all of us at the meeting was: “Huh! Are you serious? Of course you need a sales person.” I wish I could tell you that he was just ‘getting several opinions’. If you were there, you would conclude (as the other attendees did) that he was just being thick-headed. As stated in my last blog, this phase is the stumbling block for many small business owners and managers. Most owners and sales managers feel that taking a ‘broad brush’ approach is all that is needed. For example, just taking a fixed percentage to last year’s sales and increasing or decreasing that figure to derive next year’s sales. It sure is an easy way to get a number, but it doesn’t do justice to the intended forecasting process. The goal isn’t to prove that you are clairvoyant but rather to make you think about what you will do to achieve a certain goal of sales – ideally by market, product and/or customer segment. In other words, it is supposed to serve as a basis for action. This process should involve communicating with ‘vested interest parties (e.g. sales force members, customers/clients and vendors) and research into your market place, examination of competitive forces, economic research if available in your markets, and consideration of other elements such as potential acquisitions, and reductions in your product/service line. Consideration also needs to be given to new customers who may represent large accounts but whose figures are not ‘annualized’ by the forecast method. Similarly, a lost ‘major’ account can skew the forecast if proper consideration isn’t given by the method used. Suffice it to say, there are many other elements that need to be considered to develop a reliable sales forecast. If this blog stops you from using the time-worn “X % higher than last year” method, I will have accomplished my goal in this blog. HOMEWORK: Give some serious thought to how you might best approach developing your sales forecast and set a date to communicate with ‘vested interest parties’ about your sales forecasting process (as described above). I welcome your feedback on this blog and feel free to reach out for help from me at stan@fambizdoc.com. Also, please check out my new book, Set Yourself Free… How to Have a Thriving Small Business – And Enjoy It. This phase is the stumbling block for many small business owners. Their first response is “I don’t have a crystal ball and I’m not an economist!” Who could argue with them…but I don’t let them opt out on those excuses. Of course, nobody can predict the future (though many make a living convincing others they can!). However, one can examine the past and look at current conditions to establish a ‘feasible range of occurrence’. After all, one has to start somewhere in the planning process. As we gather more information, we can adjust those ranges and the ‘confidence %’. The whole point of this process is not to suggest that we are prophets but to define scenarios and how we might achieve them and deal with them – operationally as well as in terms of marketing and sales. If there is anything I want to get across in all the blogs I will write, it is that owners and managers must be ‘open to discovery’ and the way to that discovery is to identify realistic potential scenarios, think about them, strategize about them (i.e. develop alternative paths and actions) and then MAKE A CHOICE and run with it until you determine it needs some adjusting. Staying status quo should be a CHOICE…not a default for inaction, indecision or sheer terror! I hope you’ll visit me next week to pick up on this process of forecasting. You’ll see the ways that some use which lead to fallacious insights and poor planning… but are often used because they seem logical. These ‘doses of insight’ are best presented in small quantities so you have time to work with them and see how they fit for your company. I welcome your feedback…good bad or ugly! Thanks for taking the time with me. HOMEWORK: Gather your past 3-5 years sales information (by customer and product if available). Take a look at your current new account develop activity and statistics. Have them handy for the next blog. You’ll be glad you did because you’ll learn the ways NOT to develop a sales forecast (common errors) and some tips for getting it to make sense! As always, feel free to contact me at Stan@fambizdoc.com and be sure to go back to read my earlier blogs. You may also want to read my new book, Set Yourself Free – How to Have a Thriving Small Business… And Enjoy It. It’s one thing to plan but another to execute. Execution is where I find the biggest disconnect between success and failure. Whether we will build market share or try to steal it takes different execution strategies. Such factors as how we will brand our product, service or name or what form of packaging we use can totally impact our success. Such things as pricing levels and whether we will conduct a variety of tests can impact our success in major ways. Even seasonality issues and the channels of distribution we will use are all tied together. None of these issues should be viewed in a vacuum or separately on its own merits. Marketing involves considering and managing multiple dynamics for multiple variables. Even determining your hours of business requires examination. For example, some chiropractic offices open very early in the morning and close early because they cater to a senior generation for whom these hours are more convenient, while others open later close later, and have hours on weekends because they cater to younger, working patients. That is a simple example of how knowing your market demographics and psychographics can make a difference in how you service customers. Knowing this, you might find that your competition isn’t considering these factors and it might be an opportunity to capture market share simply by changing your hours of operation or how you advertise or position your practice. The point of this blog is to get you thinking about and defining your current marketing strategies and to challenge them and test them as well as identify new strategies and test them. If you don’t do this you might be accused of insanity because you are doing the same old thing and expecting a different outcome. Then again, don’t stop doing what is working! Next week we will talk about how you can satisfy the communication goals in your marketing process so please take the time to work on clarifying your marketing strategies. If you need more guidance on this topic or prior blogs, always feel free to contact me at stan@fambizdoc.com and don’t forget to order a copy of my new book, Set Yourself Free – How to Have a Thriving Small Business… And Enjoy It. How hard can it be to compare your product or service to the competition, list the attributes of importance, indicating how each builds an emotional relationship with the customer? It seems easy at first but small business owners simply say “We give better service… bla bla bla” without any specificity or without defining what that means to the customer or how it might be tied to an emotional component in the customer’s buying process. Everyone in sales knows that decisions (regardless of how logically based) are based upon emotional elements to a large degree. The question, “Why should I buy from you?” must be satisfied for a customer to choose your company. Some call this the USP – Unique Selling Proposition. Others call it the differentiators. Our goal is to have the customer logically and emotionally tell themselves, “I’d be a fool to buy from anyone but you!” To make this happen, we must position ourselves so they can form that frame of mind about our company. Rather than relying upon each prospect to identify these differentiators, we need to lay them out in our marketing materials and communication processes so they are obvious as well as subtle at the same time. Think about what matters to your customers, define how what you offer satisfies (or exceeds the expectations of the customer) in visible terms, describe what their value is to the customer and demonstrate why they are superior to the competition. However, take it past a feature-benefit pitch. For example, the competition may make a product that looks like what you offer, but at a lower price. Yet, you are the clear market leader with a proven record of on-time service, lower maintenance cost and down time, superior quality and product life-cycle. Making that ‘position’ clear so that your sales staff can take advantage of the fact that the competition’s main product line isn’t in what you are offering (i.e. it’s a sideline item) and that they have just entered your market and written reviews about their product are not flattering… including high maintenance costs and down time. This is not to be confused with competition bashing— not what is being advocated. Instead, playing on your strengths. So, what would you be saying if I met you in an elevator and asked why I should buy from you instead of your competition? Okay, I’ll give you more than 30 seconds before we reach the 30th floor! See you next week as we head toward the home stretch in this series on Marketing. 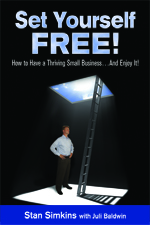 As always, I welcome your feedback at stan@fambizdoc.com and be sure to look for our new book, Set Yourself Free… How to Have a Thriving Small Business – And enjoy it. If you’ve followed this series of blogs and been faithful to the homework, then you have developed your SWOT analysis (Strengths, Weaknesses, Opportunities and Threats), set quantitative and qualitative objectives (e.g. number of units to be sold; improvements to product safety), and are thinking about new target markets. The whole point of this process is to determine scenarios and how we might achieve them and deal with them, operationally as well as in terms of marketing and sales, despite the obstacles we may believe are in our way. One easy way to identify new target markets is to simply examine the competition’s target market and determine if it is something you could service or sell to. Oftentimes the markets we serve evolved without a plan (i.e. opportunity knocked on our door or we relied on an existing customer base); so we fail to look outside our current marketplace. Our competitors can sometimes be divining rods to new market opportunities… or which markets could be a death trap to our business! There is sometimes a benefit to not being the first to enter a new market. I remember an expression I learned in a college class, “Never be the first to try or the last to lay the old aside.” Then again, sometimes being first can provide the advantage of building brand that has lasting power to create a barrier to entry. Another way to identify new target markets is to look outside of your current geographic market for territories that have similar characteristics as your own or who have an unmet level of supply or service that you excel at. Also, you may consider an entirely new type of client (e.g. residential customers where you were only serving commercial companies). Of course, cost, staffing, and time considerations have to be weighed, but that comes after we first identify the new target markets. This process is one that is more like brainstorming and we don’t want to edit out any of these at this point. That will come with further analysis of cost, time, staffing, and profit potential. I’m confident you get the point and can use your own imagination, experience and creativity to fill the rest of the blanks on this topic. Tune in next week and you’ll hear one more piece to this process – after which we will discuss the dreaded topic of developing a Sales Forecast! HOMEWORK: If you haven’t finished all the pieces of the plan so far, take the time to do so. You will have a wonderful tool with which to grow your business. If you are just joining us, go back to the previous blogs and begin the process. You have time to catch up! Of course, always feel free to reach out to me. I am here to help you move forward in your process of planning. You are currently browsing the archives for the Marketing & Sales category.